Angiogenesis, a process that is predominantly driven by the vascular endothelial growth factor (VEGF) signaling pathway, plays an essential role in tumor progression and metastasis. Accordingly, a range of anti-angiogenic agents, most of which block VEGF or its receptor, have been approved for the treatment of various malignant diseases. 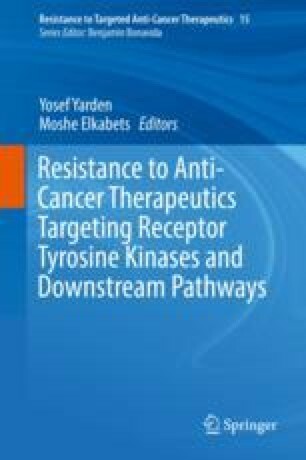 However, the clinical benefits of anti-angiogenic therapy are relatively modest for several reasons, some of which are related to the development of therapy resistance. Since anti-angiogenic agents target the tumor-supporting vascular system rather than the tumor cells themselves, resistance is dependent on the interplay between the host- and tumor-mediated pathways. In general, the activation of various evasive mechanisms allows for sustained tumor vascularization and growth despite the therapeutic blockade of the drug target. These mechanisms include the upregulation of bypass angiogenic pathways, pro-angiogenic activity of infiltrating stromal cells and alternative vascularization processes. In addition, off-target effects of anti-angiogenic drugs have implications for tumor aggressiveness. In this chapter, we discuss the molecular and cellular mechanisms contributing to therapy resistance as well as possible strategies to improve the clinical outcome. This book chapter is primarily supported by the European Research Council (#260633) and Rappaport Institute funds given to YS. KM is supported by a student fellowship from the Lyon Sachs University of Toronto— Technion Collaboration Fund.